Well, despite the past few days of IDF attacks, thousands of rounds fired, and a miraculous zero Palestinian casualties (except for those killed by friendly fire in their own living rooms), the Palestinian terrorists have managed to send a Kassam missile that has reached Ashkelon. This as Olmert has stopped his push into Northern Gaza while the Kassam missiles not only haven’t stopped, but have increased in range. This has been making the rounds through the internet. When Fox News interviewer asked former Israeli Ambassador Alon Pinkus. “It’s OK to go in to invade over a soldier, and not a settler?” Pinkus gives a rather unsurprising answer. “There’s seems to be a different attitude when it comes to freeing a soldier than a settler who probably was murdered in cold blooded, [who] should not have been where he was,” Pinkus stated. Now I don’t know if Pinkus is expressing his own opinion, or if this is how he understands the "logic" of the government, but there is that minor fact that the “settler” Eliyahu Asheri was kidnapped from within Jerusalem at French Hill. So are we now to assume from Pinkus’s answer that Jews don’t belong in Jerusalem? Maybe Jews do not belong in French Hill? Has the government also given up on Jerusalem? Or is it simply that “settlers” are second class citizens wherever they may be? (and I'm happy to see not so many hits on Shabbat). But how do I get you people to start commenting? 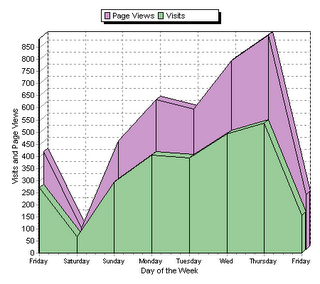 Special thanks to Jameel for helping popularize my site with his readers. Update: Thursday didn't turn out so bad at all. Have you noticed, despite all the IDF attacks this week, despite all the sites bombed by IDF air, tank, and artillery units - unlike us, the Palestinians have yet to report a single casualty on their side: "No Palestinian casualties reported."?! Perhaps Peretz and Olmert are in charge. Anyone wonder who's running the war? Defense Minister Peretz has been rather inconspicuous these past few days except for mentioning that he will destroy some settlements, he’s clearly not involved at all. Prime Minister Olmert sounded more and more like a broken record with his talk of potential threats and his continuing dream of a negotiated peace settlement, until something finally cracked. I would venture to say that the army recognized the shock, inexperience and ineptitude of our civilian leadership in military matters and simply rammed through what they’ve wanted to do a while now. Not a military coup mind you, but simply taking advantage of Peretz and Olmert’s frozen indecision and naiveté. While Olmert floundered and faltered, begging for a negotiated agreement - doing everything he could to avoid actually hitting back, he probably reached a point of collapse from indecisiveness and it was at that point the army began putting serious pressure on him to implement their plan. I wouldn’t be surprised if the army purposely only presented him with one plan. In his collapse he is finally letting the security services do their jobs, without giving clear political objectives (well he is, but it is limited to getting the soldier back and then leaving). I just hope he doesn’t wake up and stop the security forces before they are finished (and finished doesn’t mean just getting the soldier back). Anshel Pfeffer of the Jerusalem Post notes the following. Despite the big show of force and overwhelming (?) entry in Gaza – there have been zero Palestinian casualties so far. Israel, as usual, has been attacking empty fields and structures (no matter how important those structures are), and has purposely actually avoided confronting actual live enemy targets (even safely from afar). Pfeffer believes that the army is simply positioning itself to give Olmert and Peretz the possibility of a full range of options, with the complete understanding and fear and that Olmert and Peretz may simply not know what options they want to (or should) take. Eliyahu Asheri, 18, was executed by Palestinian Fatah terrorists on Sunday, the day he was kidnapped. Asheri apparently didn’t hitchhike from some deserted, isolated hitchhiking post, but rather most likely got into the car at French Hill, inside Jerusalem, where hundreds of Jewish people gather to hitchhike from every day. Meanwhile there are still unconfirmed rumors on 2 other potentially kidnapped people, one from Rishon Lezion and one from Bikaat Hayarden. Iran has come to Israel, by way of Iraq and Lebanon. I came across this blogger. When I first discussed the attempted kidnapping of hitchhikers in Pick out the Ghetto Jew, a number of people responded saying that Settlers shouldn’t hitchhike where it is dangerous, and the girls were at fault and they shouldn’t have been there, and so on. "As the security forces did not prevent Israeli citizens from traveling on Egged buses in cities targeted by suicide bombers, the army should not surrender to terror and disrupt the life of Yesha Jews and lock them up in ghettos." I think if you want to be consistent in your advice then you should also criticize those that continued to take bus number 18, or those who walked on Ben-Yehuda. You should have criticized the security forces for not demanding that people stop taking public transportation. Instead people (on and off line) differentiated between the basic right of security of the citizens based on his home address. People wrote that we are also at fault for engaging in “dangerous behavior”, as opposed to the terrorists solely being at fault for creating the dangerous situation and the government for letting it persist. There are at least 2 confirmed people that have been kidnapped this week (there may have been a third that hasn’t being publicly announced yet). At what point do we stop blaming and differentiating between victims and lay the onus and solely on the evil Palestinian perpetrators? Listening to the radio yesterday I heard a well-known (Israeli - duh) journalist say “Historically, only negotiations and not the use of force ended wars“. I guess he never heard of World War II (to mention the most obvious). I always wonder when I hear that statement, if the author was constantly beat up in school and his lunch money taken away. But actually, that is symptomatic of what Daniel Pipes describes as the typical Israeli attitude towards war: management & containment, not victory. Pipes feels that Israeli’s don’t understand the concept of total victory and therefore they always stop before it is achieved or worse, never try to achieve it in the first place. I think the real problem is that Israelis don’t have a goal or vision, so they find themselves floundering when they reach the point where a real decision needs to be made and a (political and military) direction chosen. Yesterday Haim Ramon made an amazing statement. He declared that "there is no one to negotiate with on the other side". Wow. More than a decade after Oslo Ramon has finally woken up to reality and repeated what the Right has said all along. While certain sectors keep talking about the “Right” giving up their dream and moving Left (no right-winger I know has done that), are we are perhaps now beginning to see the Left waking up and moving right? Because Ramon still doesn’t have what it takes the reach the proper resolution to the problem. As a Leftist he now believes in running away, hunkering down, and hiding behind a wall - basically giving up. Again, the concept of victory eludes him, and of course, more creative solutions than simply giving the enemy more access to weapons, more freedom to terrorize, deporting your own population and generally destroying Israeli deterrence are still completely beyond his grasp. It took Ramon 12 years to admit he and the Left were wrong. Now let’s see how long it will take him to reach the Right conclusions. 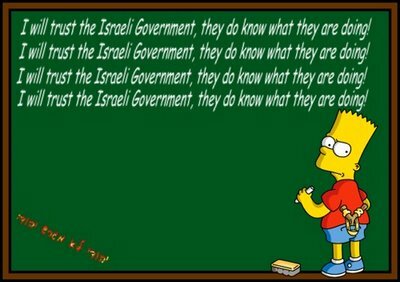 I will trust the Israeli Government, they do know what they are doing! Yesterday’s attack weren't the actions of an impromptu band of terrorists. It was a well-planned and premeditated attack with support from the highest PA government sources. The timing of the operation may not have been convenient for some in the Hamas government right at this moment, and that probably indicates an internal rift on high, but everyone (and I mean everyone) was involved in planning this operation. But has anyone thought for a second what the goal of the operation was? “To kill IDF soldiers”, you are probably saying to yourself. But no it wasn’t that, that was just a perk. It was only and solely to kidnap as many IDF soldiers as they could. To trade them for prisoners? They could have easily kidnapped soldiers in the West Bank without the elaborate tunnels, and missiles, and so on. The goal here is far different. 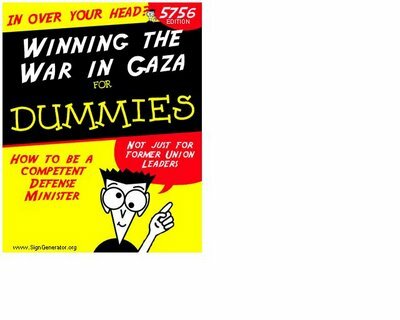 The Palestinian Authority Terrorists wants Israel to invade Gaza, more specifically; they want Israel to mass on the ‘border’ and then invade Gaza. They know the limitations our Leftwing government will place on the IDF. They know what the IDF will be forbidden to do. They plan to take advantage of that. To begin with, Gilad Shalit the soldier, is no longer in easy reach of the IDF. I would even doubt at this point if he is even in Gaza anymore. Spiriting him far away was clearly part of the plan long before. You can see Iran’s finger in this operation. But why would the PA want Israel to invade? Because they know that the IDF will gather troops outside the fence and only then start sending them in. You see, Olmert and Peretz have no plans to properly launch a ground offensive. It would go against their ideology and “worse” cause international condemnation of Israel. They have no plans to soften the enemy in advance of the troops going in. They didn’t shut off the electricity and water in Gaza right away to cause confusion and disorder among the population that would have caused logistic and mobility problems for the terrorists (such as how to hide and move our soldier). The IDF didn’t immediately react in force, a lesson you would have thought they would have learned already from the Lebanon retreat (probably because of fear of repercussions from our Leftwing government and the years of Leftwing training to be submissive in the face of the enemy). In fact, we can probably assume that the inexperienced and Leftwing government gave the IDF orders to stand-down to “avoid having the soldier harmed”. This government will not be launching a series of precision bombs against the heads of the Hamas and Fatah to remove the leadership and command-and-control capabilities of the terrorists. They will not even order carpet bombing of the buildings in the IDF’s path that will present excellent base for the PA to attack IDF soldiers –leaving us with another Jenin. The Israeli Leftwing government simply gave away the very narrow window of opportunity to foil the PA’s plan to spirit away the soldier when it did not react right away, just like when Hizbollah kidnapped our soldiers after Barak ran away from Lebanon. As much as they don’t want to, and are still trying to avoid it, instead Olmert and Peretz will eventually have to have the IDF mass on the border, and go in that way – the stupid way. So ignoring for a second the PA’s more accurate weapons (which they have) and the fighting in the alleyways like in Jenin - a few unwell-placed Kassams in the middle of the budding IDF forward offensive base will simply wreak havoc on the IDF. You see, unfortunately I think that this is what the PA really has planned. IDF operations have begun predictable. Coerce the government with the right amount of pressure to act, and burden them with the right amount of international (and leftwing political) pressure to limit what actions you can take, and unless you consciously choose to be more aggressive and creative you will find yourself in a box, which is what is probably going on down in the Pit. So our troops will eventually be gathering on the border in large clusters (exactly like before the Expulsion) making them easy targets for anything the PA wants to launch at them (with whatever payloads they want inside) - and they will. The alternative is that Olmert and Peretz are actually psychologically frozen and will simply do nothing militarily. This isn’t about releasing Hamas prisoners, and this is one analysis that I hope I am wrong about. Not a single Right winger should be forced to die because of the stupidity of the Left and their leadership. Well, I’ve personally had enough. If the Left want to surrender, that’s their problem. There is no reason anymore for any Right winger to continue to be cannon fodder for the idiotic and messianic Left’s delusional dreams of peace. What an interesting weekend this is turning out to be. Four Five Six (and counting) IDF soldiers were hurt as their position and tank were hit by an anti-tank missile by (Palestinian) terrorists (who apparently entered under the fence into the nearby army (illegal?) outpost and possibly in an additional attack (no details yet). So far at least one soldier may be killed and his body stolen into Gaza. Israeli residents in the South were warned to stay in their homes due to the infiltrators. On Friday a remote control bomb went off near Neve Daniel in Judea. A number of Kassams were launched against S’derot as usual, while the neighboring mayor of Beit Hanoun in Gaza (where the missiles are often launched from) stated that the missiles aren’t being launched to kill anyone, just to fight the occupation. Apparently Meretz agrees with the Gazan mayor’s assessment because today they are protesting in front of an IAF airforce base demanding that the IAF/IDF stop retaliating for attacks on Israel. A truly unnecessary protest, as Prime Minister Olmert, after spending the week apologizing for even thinking of hitting back (or not hitting back, but getting blamed anyway), has already ordered a cessation to the air retaliation. Meanwhile Defense Minister Peretz is also far too busy to fight the Palestinians as he is putting together his master plan to give over more parts of Eretz Yisrael to the Palestinian enemy so they can attack even more. He has ordered the restraining (and probably administrative detention - arrest without charges, evidence, or warrant) of 13 Israeli citizens who he feels will disrupt his ability to destroy Jewish homes. And finally the terrorist groups of Hamas and Fatah have agreed to the Prisoner’s document which calls for a unified strategy for destroying Israel (yipee, at least someone is getting along). Hamas took credit for this morning's attack. And it's only Sunday in Chelm Israel. I received the following from Manhigut Yehudit. Re-education is the application of coercive techniques to change the beliefs or behavior of one or more people, usually for political or religious purposes. Re-education is generally associated with dictatorial regimes or religious cults. But it is alive and well in Israel's court system. Oriyah Shirel is a 15 year old girl who lives in Hebron. She is a typical "settler" teenager, busy with school and social events while devoting much of her time to help strengthen the Jewish hold on the Land of Israel. A week and a half ago, Oriyah was arrested at a demonstration in the Jewish Quarter of Hebron. Initially, no charges were pressed against her. The judge ordered to free Oriyah on bail. Oriyah refused to take part in the farce. "I did nothing wrong," she said, "and there is no reason for me to sign on bail and thus recognize the court system that consistently fights against me and my ideals." The judge sent Oriyah back to her jail cell. was imprisoned to force her to change her opinions and ideals. In plain English, that's called re-education. that Oriyah did nothing wrong. "Furthermore," they added, "the court is not neutral, but rather has an agenda of its own. The court's agenda is to fight against our ideals and to coerce us to accept its worldview. While we have simply our Jewish faith on our side, the court has an entire system of judges, police and prisons to force us to accept its dictates. There is a struggle today in Israel between those people who want a Jewish state and those who want it to be totally secular. The place for that struggle is not in the courts. The court has no authority to force its agenda upon us." There is no direct proof that Oriyah did anything illegal. The reason for Oriyah's imprisonment is her refusal to recognize the authority of the court. Oriyah will remain in jail until she signs on bail. The honorable judge's written decision concurs in black and white with Oriyah's claim. The name of the game is re-education. Oriyah is now back in prison. Not because she committed a crime. She is there simply because the court's re-education project has not yet been successful. Oriyah is a strong girl and has a solid support system of family and friends. With G-d's help, she will be fine. What is not fine is the fact that Israel's ruling elite is using the court system to oppress and re-educate Israel's Jewish majority. One of Manhigut Yehudit's major goals is to replace Israel's judicial oligarchy with true Jewish justice. We will continue to explore this issue in an upcoming article. Click here for a live interview with Dovid Shirel, Oriyah's father. Ehud Olmert has been hinting about the wide-scale deportations and expulsions he is planning that will rival in size the number of Jews expelled from Spain in 1492. There is talk that communities like Bet-El, Ofra and Kedumim are perched precariously under the sword of King Olmert (would that make Peres Torquemada?). Olmert has decided to be magnanimous and offer me me the choice as to where I can live. “Each and every one of the settlers who live in territories that stand to be evacuated will need to decide whether to live in a Jewish state, the state of Israel, or in a Palestinian state," Olmert said. Well, guess what Ehud. I choose option 1 – to live in a Jewish state. So Ehud Olmert – go home and leave me alone. 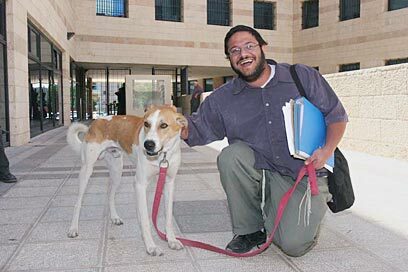 Itamar Ben-Gvir wins yet round against police harassment. Itamar, a Hebron resident, is a favorite target for police harassment. So every time he is charged with something or generally harassed he takes the police or the government to court – and guess what, in the end he usually wins. Recently policeman threatened his dog Chompy, and then later at midnight arrested Ben-Gvir and brought him in for an “interrogation”. The court determined that it was obvious that Ben-Gvir was brought in under false arrest. Read about the Chompy’s court victory here. The following was sent to me. It was originally published in Arutz-7. It is in line with ideas I have mentioned in the past and certainly confirms statements made by my neighbors in the villages next door when I've discuss the idea of living overseas with them. Below is the (long) article, but the entire plan can be viewed here. The Israeli public understands that there is not, and will likely never be, a partner for peace among Palestinian Arabs. Thus, the question arises what to do about the West Bank and East Jerusalem Arab populations. Reconquering and annexing the West Bank has been ruled out for demographic reasons.Various plans to transfer the Arab population have been rejected: no other country is willing to negotiate a population transfer treaty with Israel; and the Israeli Jewish population flatly rejects the notion of forced transfer. The primary solution proposed is one apparently opposed by a significant majority of Israelis -- another unilateral withdrawal. However, there is a practical alternative, which would neither force anyone from their homes nor violate the civil rights of any Jew or Arab. First, the often-cited numbers, supposedly justifying the need for a quick demographic fix, are based on falsified Palestinian Authority data. According to a "path breaking study" by analysts Bennett Zimmerman, Roberta Seid and Michael L. Wise, "The Million Person Gap", published by the Begin-Sadat Center for Strategic Studies, a 67% Jewish majority currently resides in pre-1967 Israel and the West Bank. After adjusting for Palestinian Central Bureau of Statistics (PCBS) errors, the study states,"the Arab population in the Territories at mid-year 2004 was calculated at 2.49 million rather than the 3.83 million reported by the PCBS - a gap of1.34 million persons." Furthermore, data presented by Zimmerman, Seid and Wise in "Population Forecast for Israel and West Bank 2025" demonstrate that if current Jewish and Arab fertility trends continue, Jewish immigration reaches 50,000 per year, and Israeli and West Bank Arab emigration reach 10,000 and 20,000 a year, respectively, then the current 67% Jewish majority in pre-'67 Israel plus the West Bank would actually rise to 71% by 2025. Second, a poll of West Bank Arabs aged 17 and over, conducted by the Maagar Mochot firm and The Palestinian Center for Public Opinion under Dr. NabilKokli's management, astonishingly found that...according to a representative sample of the adult population in Judea and Samaria, over 40% [of the] respondents have considered emigrating permanently to some other country. Furthermore, only 15% stated that that...no inducement... could prompt them to leave their present place of residence permanently. By contrast, 70% identified some form of material measure, translatable into monetary terms (such as accommodation, education, financial compensation and so on), that could bring them to emigrate permanently. Moreover, the study found that 17% of individuals over age 17 would emigrate abroad immediately if they had the resources to do so. Including those under age 17 who would emigrate brings total potential immediate emigrants to about 23%. Israel runs a government Ministry of Immigrant Absorption dedicated to aiding Jewish immigrants to Israel. The state should also establish an"Emigrant Aid Ministry" or "Emigration Agency" to provide parallel assistance to non-Jews wishing to leave Israel or the West Bank. A Dahaf Institute poll conducted on behalf of Madar, the Palestinian Center for Israel Studies, found that 59% of Israeli Jews felt that the state should encourage Arabs to emigrate. The immediate question is whether such a strategy could practically replace unilateral withdrawal in order to resolve the demographic issue. Would It Be an Effective Answer to the Demographic Problem? "Population Forecast for Israel and West Bank 2025" and increasing West Bank Arab emigration to an average of 50,000 annually starting in 2006, a number of realistic scenarios emerge in which the Israeli and West Bank Jewish population could increase to approximately 75% of the total by 2025, thus allowing Israel to end the conflict by annexing the West Bank, yet maintaining the state's Jewish and democratic nature. Assuming a near-term bulge in emigrants of 100,000 annually for the first three to four years, as individuals having expressed explicit desire to emigrate do so, the long-term demographic situation becomes even more favorable from a Jewish perspective. Long term, the effect of Arab emigration would be even more pronounced if it created a "birth dearth" situation, in which most emigrants tended to be of child-bearing age, young singles or families with a few small children, as happened with Lebanese migration. Thus, encouraging an already-strong Arab emigration trend would provide an important part of a viable long-term answer to the demographic problem. For any emigration plan to work, the Israeli government must be able to execute it unilaterally, with the full consent of emigrants. This proposal hinges not on coerced mass emigration, but on individuals and families freely and willingly immigrating to other countries through normal, legal immigration channels. Migration statistics provided by the Organization for Economic Co-operation and Development reveal that millions of legal immigration slots are available in countries worldwide. Religious- and ethnic-based quotas, such as the infamous anti-Jewish quotas of the 1930s, are a thing of the past. Today, democratic nations generally govern admission of legal immigrants with more or less impartial and non-discriminatory regulations. Other types of quotas, such as country-of-origin quotas, are unlikely to be problematic: 50,000 emigrants annually averages out to only 2,500 immigrants to each of 20 countries. Educational level apparently does not materially affect the ability to successfully immigrate. Only 320,000 out of 895,000 Lebanese emigrants from 1975 to 1990 had either a higher education or specific labor skills. shekels, would translate to about 100 billion shekels for a similar West Bank Disengagement. The International Monetary Fund reports that the original Disengagement budget was about five billion shekels, or 1% of Israel's projected 2005 GDP, spread over a three-year period. Assuming that the original estimate was acceptable and was expected to have minimal economic impact, then a 1.6 billion shekel annual outlay could be considereda reasonable base budget for an Emigration Ministry. Assuming an average emigrant family unit of five (two parents and three children), this would provide a budget per family of 160,000 shekels or about US$34,000, including administrative overhead. Assuming an administrative cost of 4.95% would leave $32,700 for direct aid to each family. Deducting average travel costs of $500 per person, based on current one-way international airfares, would leave $30,200 in aid for a five-person family. In the West Bank, 2005 estimated per capita income was approximately $1,000. For the average West Bank Arab family, the aforementioned grant would constitute nearly 30 years' income. cover a family's living expense for several years. Even in the First-World USA, it could cover expenses for 2-3years in inexpensive regions like the Mid-West. In comparison, some 895,000 Lebanese emigrated between 1975 and 1990 and another several hundred thousand Lebanese have emigrated since to escape conditions similar to those in the West Bank. The primary difference is that most West Bank Arabs lack the means to emigrate on their own. To view and sign a petition calling for the implementation of this plan please go to http://www.petitiononline.com/altern1/petition.html. Our illegal (out)post (initially built with permission and approval on unclaimed blogspace) at the Muqata was just forcibly evicted by Jameel. Thousands of bloggers come out to protest. Defense Minister Peretz whined today that Israel can’t retaliate against the Palestinians for hitting S’derot, because then the Palestinians will hit Israel back even harder. Surreal. Peretz is going to be have to be dragged, kicking and screaming, into Gaza. It will happen though. There’s really not going to be much choice very soon, and because of the disengagement, it’s going to be much, much, much more costlier than it would have been last year. "I don't understand what the hysteria is about. Kiryat Shmona was shelled for years." "Our response is causing the other side to strike." My G/d. I live in Chelm. 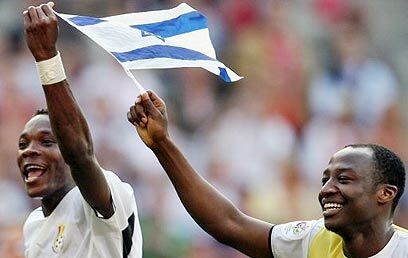 I’m not following the Mondial, I know nothing about HaPoel Tel Aviv (except that they don’t wear yellow), Ghana is a place I have never even dreamed of visiting, and soccer European football doesn’t interest me in the least, but I do know one thing, I can recognize when someone shows gratitude to someone else - and that is what player John Paintsil from Ghana, playing in the Mondial, who normally plays for HaPoel Tel Aviv did this week after scoring some touchdowns goals. 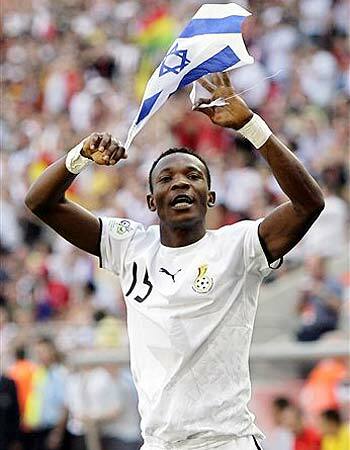 He pulled out and waved an Israeli flag and showed true gratitude and appreciation. Prime Minister Ehud Olmert is talking realignment, Defense Minister Peretz is bragging about ending Kassam attacks for a whole day (not even), the OU is showing how progressive they are when it comes to Israel related “politics”, and Yair Lapid is ashamed he’s a child killer (oh please). Meanwhile the residents of S’derot are declaring a citywide strike, have shut down their schools and are blockading the entrance (and exit) to their city. Luckily their interdiction won’t affect most people in the country because the Mondial has everyone’s attention. And this is exactly how the Left brought us 12 years of Oslo terrorism and then the expulsion and abandonment of thousands of Jews from their homes in Eretz Yisroel. As a group, except the settlers, no one really cares anymore what is going on outside their little world. Olmert and Peretz are purposely dragging us to the disaster of the next expulsion. And while the laity of American Jewry might be upset, their leaders are certainly not setting particularly inspiring or shining examples. I suspect people have simply given up fighting the overtly corrupt system. Unfortunately the proof is in S’derot. How often can they get hit? How much damage must be done? How many people must get hurt or killed? Residents have been on a hunger strike for at least a week now (two people have collapsed so far). Children no longer go to school. People are afraid to go to work and are looking for ways to leave the city permanently. Right now it looks like Sharon, Olmert, and Peretz’s realignment will hit S’derot even before the settlements (by about 2 weeks), this time outsourced it to the PA instead of the IDF. The real solution is not deployed and nothing effective is being done (Peretz even offered to let the Arabs keep their Kassams in storehouses, just don’t shoot them at us), and if something will eventually be done, it will already be too late for many of the traumatized residents of this town, but worst of all, can you imagine that they had to even reach this level of protest just to even get a reaction! When people can reach the level of protest that the residents of S’derot have achieved and still see nothing in the field, no response, no reaction, and no intervention – well then that is a message to all the citizens of the State of Israel. Your opinions, your votes, your lives, your homes, your jobs, you – are insignificant and irrelevant to the political leadership of this country. And when that happens often enough, as it has over the past 12 years, people begin to hunker down and ignore the outside world as it closes in on them. It is time for new leadership to get up and lead. Not the confused ‘Mamlachti’ who would have condemned Yehudah HaMacabbi, but those like Dovid before he became king - someone who will inspire us with his ten thousands. I can’t quite find the underlying message that Steve and Natty are trying to deliver in their article. Or rather I can and I find it pathetic. I understand when they say that U.S. Orthodox Jews are the most connected to, and aligned with Israel, and are growing in strength politically in the U.S., but then I get lost. Feelings “analogous to those felt by religious Zionists in Israel”? But let’s leave that aside for the moment. It’s the next part which has me really confused. The way I understand it, they are saying that if Olmert wants support from U.S. Orthodox Jews (or at least quiet from them) then he must engage them in dialogue. The way I read it, they are claiming the role of the coward facing off with the bully, afraid to fight him, so he say to his friends, “hold me back, hold me back, before I do something”. Picture is unrelated to the article except as an analogy. Continue to remain silent and tacitly support the next expulsion. It really isn’t connected to you at all, not in reality and not in analogy. Besides for your ego and conscience, you obviously only really need Olmert to talk to you so you can have an excuse to “hold you back”. Expulsion Watch: Electricity was knocked out in S’derot today by some Kassam missiles (which also hit a school). Not to worry, Steve and Natty were not affected. I’m going to step away for a second from Kassam attacks, Reinforced Roofs, and Security Fences and ask you to play a new game. It’s called ‘Pick out the Ghetto Jew’. It’s rather simple. You see the statements, and then decide which ones represents the Ghetto Jew, and which one represents a Jew with self-respect. Scenario: Yesterday, Palestinians tried to kidnap two 14 and 15 year old girls (brave men these Palestinians) who were hitchhiking in the Shomron (the girls were waiting at a designated hitchhiking post). B”H they got away and the Palestinian terrorists (redundant phrase) were captured. - (a) A government radio announcer asked one of the girls if “she learned her lesson”. - (b) The IDF recommends that people not hitchhike. - (c) The Yesha council demands increased patrols instead of reduced hitchhiking. Which (cowardly) statements indicating that we’re abandoning the field and our security to the enemy and is the reaction of a Ghetto Jew (A, B)? Which statements point to Jews (ignoring the actual author of the statement) who still maintain their self-respect (C)? Without even disussing hiding behind a wall or reinforcing roofs, I’ll leave it for you, the reader, to figure out the answer. There should be no reason you can't sleep at night. I am so glad that Defense Minister Peretz managed to stop all the Kassam missile attacks today, not to mention foiling the attempted kidnappings, because that gave him time to give the army priority orders to make dismantling outposts “within the next 2 weeks” their first priority. It reminds me of when other leftist Israeli governments would find Israel under terrorist attacks over the years. They would then strike “back” at some completely unrelated substitute Arab enemy (usually in Lebanon) – presumably because they knew where that enemy actually was and it was safer to attack them instead of the real attackers. As long as Peretz's priorities are straight, we can sleep at night – unless you live in the south. How much cash can you fit in your suitcase? Now you may not realize it, but this is far from an academic question. When you are the cash-strapped Palestinian Authority it is important you get in as much cash as possible on each trip – sort of like in the old days when the question was how much computer equipment could you smuggle in past Israeli customs. The answer to the cash question though is actually academic or at least scholastic. Let’s say Palestinian Foreign Minister Mahmoud al-Zahar flew in on El Al (economy class - the PA is cash strapped you know). Now we all know that El Al has new regulations requiring each suitcase to weigh no more than a maximum 50 pounds. We can assume that al-Zahar isn’t a cheapskate when it comes to someone else’s money, so he’ll probably decide to pay the overweight fine and bring in a suitcase weighing 70 pounds. Assuming the check-in lady wasn’t having a good day, and he couldn’t charm her, al-Zahar would have been fined an overweight charge of $100 – so don’t forget to deduct that at the end of the calculations. A stack of twenty individual dollar bills weigh .7 ounces. That means that there are 457 bills in 16 ounces (I’m rounding down for the rubber band). A full 70 pounds would then be 31,990 bills. Assuming al-Zahar's counterfeit money is in all hundreds – that means that Palestinian Foreign Minister Mahmoud Zahar smuggled in $3,199,000 in his suitcase. But wait. Is there enough room in his suitcase for 31,990 bills (and his underwear)? A dollar is around 2.5 by 6 inches and 100 stacked bills are about .5 inches high. El Al allows you a suitcase whose maximum size is 62 inches (well that is what it used to be, I don’t remember the new smaller size, so Zahar might also get hit with an oversize fee too, but we'll ignore that for the moment). What this means is that the width + height + depth of the suitcase must be equal to or less than 62 inches. Let’s get him a suitcase that is 30” x 24” x 8” – exactly 62”. This means that al-Zahar could actually fit 76,800 counterfeit bills in his suitcase and assuming they are all hundreds, meaning $7,680,000 dollars. But he has a small problem as it would weigh 168 pounds, and that would require 3 suitcases at least. As the article said, al-Zahar smuggled in a single suitcase stuffed with cash, so now we can be sure that he did not bring in more than $3,199,000. Whoops. No more than $3,198,900 – almost forgot his overweight fine. Ha’aretz reports that al-Zahar had $20,000,000 in 12 suitcases. So either he didn’t maximize his suitcase's weight potential or he took an airline with smaller weight allowances per suitcase (perhaps he flew in from Europe). Assuming just 1 suitcase was full of clothing, and the others weren’t full of LCD TVs, so the cash poor Gazans could watch the Mondial on the beach, that means each suitcase weighed just under 40 pounds. "It all began when Israel hit back"
I saw that quote somewhere yesterday (I don't know where), and thought how appropriate. In line with my comment that it was unlikely that we did the Gaza Beach Blast, the Muqata has confirmed that the Hamas was responsible for killing their own people. Actually it's a good thing we apologized at the beginning of the week because today we attacked a bunch of terrorists and caused some collateral damage among the civilians. I really hope we can get to apply the apology credit/refund from the beach attack to this one. It would be a shame to have to apologize twice. Callous of me? I don't think so. This is a war and I still don't hear anyone apologizing for S'derot. Bank of Israel's top execs pull down way more than US Fed's top execs. According to this article, the (Bank of Israel) ombudsman got paid the equivalent of $262,114 in 2004. By contrast, I surfed the internet for info on the US Federal Reserve Bank and found that, "Congress sets the salaries of Board members. As of 2004, the chairman's annual salary was $171,900 and the annual salary of the other governors (including the vice chairman) was $154,700. It's fascinating to compare the differences between the US and Israel. In the US, the salaries of the Fed are determined by congress and openly (if I only knew where to search). Here in Israel, the BOI apparently sets its own salaries, and has the right (or at least the power) not to publish the way it uses public funds to pay its employees. In the US, which I'm guessing is a more demanding job, the top dogs at the Fed earn considerably less than $200k per year, while in tiny Israel, even the ombudsman is pulling down well over $200k, and will soon be making $713k per year, though this includes all payments including pension funds. Still, the real annual salary is certainly well in excess of $500k. You gotta love the chutzpah of the folks who run our dear country. You can read the RCA's statement on the compromise here. So as to facilitate proper recognition of individual status in Israel by the Chief Rabbinate, it was agreed that the Joint Commission will, inter alia, prepare lists of approved Batei Din and rabbis in North America dealing with personal status matters. From time to time, however, the composition of the lists will be appropriately reviewed, in light of new realities and circumstances. In the future, any rabbi who wants to be involved in personal status matters that he wishes to have recognized in Israel, will need to comply with the standards thus agreed to by the Chief Rabbinate and the Rabbinical Council of America. It was also agreed that all conversions, authorized from the Rabbinical Council of America in the past, and as such, previously accepted by the Chief Rabbinate, will continue to be recognized by the Chief Rabbinate. I'd really like to imagine that JoeSettler played at least some minor role in helping illuminate some of the missing 'hasbara' facets which were generating a lot of the underlying tension on the other side. I’m glad that the Chief Rabbi's major policies and goals are still in place (but disappointed that the US Rabbis don’t have to go to Israel to get approved - I think it would have helped them "maintain and foster their passion for Israel” ). There seems to be nothing more common in the Middle East than self-inflicted injuries. The most obvious are Arab suicide bombers - but they are far from alone. It’s no mere coincidence that the press is likening the ‘anger’ of the Palestinians over the beach explosion deaths to that of their anger of the slaying of Mohammad al-Dura – since after all, they were all murdered by their fellow Palestinians. As of this writing it hasn’t been confirmed that the Palestinians murdered their own on the beach (presumably in a work related incident) but let’s get real – it’s very likely that it will be. But the Palestinians aren’t the only ones with self-inflicted wounds. Today, all our government officials were busy saying they were sorry to the terrorists, accepting the Palestinian accusations, once again, as fact. These people simply never learn. And even if we did do it, why are we apologizing? We are only shooting back because they are shooting at us first. We mustn't forget that Ehud Olmert apologized last week to Mubarrak for the IDF killing Egyptian soldiers involved in a terrorist attack against that IDF unit. That IDF unit is not too happy to hear that piece of nonsense. I wonder what it has done to their morale. And of course, over Shabbat, the frustrated and confused Israeli army kicked out a bunch of kids sleeping on a hill in a tent near Hebron, purposely destroying the kids' property while they were at it. Way to go confused soldiers – a shame they can’t identify the enemy. And of course we can’t not mention Ehud Olmert’s daughter protesting in front o f Dan Halutz’s house, calling him a murderer. Kossack (for his role in the Gaza deportations) I can understand, but murderer? Feh. Nothing more than two leftists who really deserve each other. But hey, all of them are just self-inflicted wounds. As I mentioned the Settlers had planned a creative protest today to fight the government's plan to dry up our communities by creating artificial traffic jams, and keeping perfectly good alternative roads closed. The creative protest was the opening of the Tekoa road by Settlers from Gush Etzion on one side of the barrier, and Settlers from Jerusalem, Be'er Sheva and Tel Aviv on the other end. Here is a quick note from Nadia Matar describing today's events. Still exhausted from everything involved around this march. I will not go into details but just to say that the Tekoa-Jerusalem Road opening was a HUGE success. Over 80 cars came from the Tekoa end with in each one at least 2 people, sometimes 4 or 5. From Har Choma some 200 people started the walk- some 80 made it to us. We drove from tekoa on this beautiful road- when you drive there you ask yourself "how on earth is it possible to not open this road immediately?" The army said there is no problem to drive till the blockade close to Har Choma where we become the "problem of the Jerusalem police"
We saw the people that had left from Har Choma approaching, They had also gone through complicated ways to make it till us. Both groups united , embraced-and the organizers declared that the activity had succeeded beyond any expectations- both groups had joined forces on the road and had managed to connect!!! Har Choma Beyadeinu!!! we declared. We know that despite all kinds of disinformation from the police and people who pretend they are from the moetsa of gush etzion but whom we think might be shabak- the battle for the road is hardly over. The police has put out a flyer that they are willing to rethink positively about the reopening of the road- the gush etzion residents received it in their mail last nite !!! We’re going to be hearing a lot in the upcoming weeks about the Palestinian ‘Prisoner’s Document’. The (left-wing) press is going to be discussing it as if it were some Peace Process Breakthrough, and the ignorant Israeli is going to think, gee, maybe there is a partner. Well, I guess the best way to dispose of that idea, at least for my very limited audience, is to provide you with a few quotes from the breakthrough peace document the Left will be going on and on about. 1- the Palestinian people in the homeland and in the Diaspora seek to liberate their land and to achieve their right in freedom, return and independence and to exercise their right in self determination, including the right to establish their independent state with al-Quds al-Shareef as its capital on all territories occupied in 1967 and to secure the right of return for the refugees and to liberate all prisoners and detainees based on the historical right of our people in the land of the fathers and grandfathers and based on the UN Charter and the international law and international legitimacy. Translation: Implement Arafat’s phased plan of creating a State on whatever land is liberated, and flood Israel with refugees on the rest until it is demographically wiped out. 3 -the right of the Palestinian people in resistance and clinging to the option of resistance with the various means and focusing the resistance in the occupied territories of 1967 alongside with the political action and negotiations and diplomatic action and continuation of popular and mass resistance against the occupation in its various forms and policies and making sure there is broad participation by all sectors and masses in the popular resistance. Translation: Violent Intifada will continue - and we want to get more even Arabs involved in the physical violence. refugees which should come up with commissions to follow up its duties and to stress on the right of return and to cling to this right and to call on the international community to implement Resolution 194 which stipulates the right of the refugees to return and to be compensated. Translation: Keep fighting to flood Israel with Palestinians. 15- The national interest stipulates the need to look for the best means towards the continuation of participation of the Palestinian people and their political forces in Gaza Strip in their new situation in the battle for freedom, return and independence and to liberate the West Bank and Jerusalem in a manner that makes the steadfast Gaza Strip a real support force to steadfastness and resistance of our people in the West Bank and Jerusalem as the national interest stipulates reassessing the struggle methods to seek the best methods to resist occupation. Translation: Get the Arabs in Gaza to better help support, supply, and train Arabs in the West Bank, as well as find a more effective way for them to utilize their weapons against Israel. Translation: We need a stronger, better armed, and better trained army to fight Israel better. I hope this makes things clearer (even without the ‘translation’), so now when you hear the press talking about the breakthrough, understand that the document is merely an internal Palestinian document trying to enforce agreement for one particular plan for destroying Israel not for making peace. In follow up to my previous post on the Ghetto Stickers there is some action in the field that we settlers are doing to block the government’s attempt to create their new facts on the ground and prepare us for their next set of mass deportations. To begin with, most people don’t realize that former Israeli governments created a beautiful road linking the Tekoa region (Eastern Gush Etzion) to Jerusalem (Har Homa). This road takes a mere 8 minutes from those settlements blocs to right into Jerusalem (faster than from Ramot to Malcha) – but with one small hitch. A previous government decided to not pave the last 500 meters and put up a barbed wire fence at the end to prevent traffic passage. The road is simply a dirt road at that last stretch. In light of the political decision of creating artificial traffic jams on the Gush Etzion Tunnel Road, introducing Ghetto Stickers, and purposely not opening a fast road from an area they are trying to cut off (sooner rather than later), settlers from the Gush have decided to protest somewhat creatively tomorrow. You can read more about it here. Perhaps I’ll post some pictures. In the meantime to read more about police abusing their power to harass settlers read this article. I’m sure that Ehud Olmert (unlike his wife and kids) didn’t have this in mind when he pushed for his plan to label all Settler products sold in Europe with the label, “Made in the Israeli Occupied Town of [Fill in the Name]”. But hey, give an inch, take a mile. The Europeans, for some reason, just don’t agree with Israel’s internal consensus of Israel’s most minimalist borders (surprise!). While the average Israeli might think the Kotel (maybe), or the Golan Heights is our sovereign territory, for some reason the rest of the world just doesn’t agree. I guess we will have to making our plans for unilateral disengagement from the “Israel-occupied Syrian territories” (Golan Heights) because at least Sweden is acting consistently in its behavior in demanding accurate labeling on everything from after 1967 (as occupied territory). And if we intend to be consistent on our behavior, (not a left-wing strongpoint, admittedly) then the Left should begin demanding that we evacuate those Golan Heights settlers so that the rest of the world will love them (the Left) - and don’t think that at some point this won’t happen, and we’ll have to pull out those ‘HaAm im HaGolan’ stickers - again. Strip since disengagement was bigger than the total amount smuggled into the strip since the Six Day War, Shin Bet head Yuval Diskin said Tuesday in a meeting of the Knesset Foreign Affairs and Defense Committee. 2005, there were 11 tons of TNT, three million bullets, 19,600 rifles, 1,600 pistols, 65 RPG launchers, 430 RPGs and some 10 shoulder rocket launchers smuggled into Israel. smuggled in suitcases to the Hamas movement." Welcome to the Border – Please have your ID ready on the way through. A friend sent me this letter he wrote this in response to the introduction of the Ghetto Stickers in Gush Etzion. A somewhat naïve Gush Etzion resident was apparently all for the stickers and wrote that he looks forward to beating the traffic with his new sticker. “While you're busy smirking, ask some people that live in the Shomron who already have Ghetto Stickers and a Border Crossing about their daily experience. They'll tell you that their friends don't like visiting them anymore because of the harassment they get at the Border Crossing, and I'm not talking about just showing their IDs and getting the trunk checked, but the cross-examination as to what they were even doing "over the border" in the first place. They'll also tell you that despite having a Ghetto Sticker they also get stopped to show their IDs and get asked questions – particularly when other people are also in the car. So I would recommend you travel alone if you want your border crossing to go faster. Some might tell you they feel more uncomfortable now that the Arabs can 100% identify them as Settlers (and therefore targets) as opposed to before we there was at least some minor degree of ambiguity. If his letter doesn't make it clear, then here is the background information as described to me by another settler. The government is building a major border crossing just past the tunnels, just like they did in the Shomron and the Jordan Valley. Settlers will put a yellow blue patch sticker on their car indicating they are settlers and they will be told to go to the left (lane). Those told to go the right (lane) will be asked to explain what they were doing in the territories and usually have their car checked– harassment exactly in line with Giladi’s plan to dry up the settlements. The left line will probably move faster, less due to the lower level of harassment that will be newly introduced, but more likely as fewer non-residents will want to travel there due to the extra hassle. Particularly over the last decade the radicals of Tel Aviv (and Hebrew) University have been pushing their minimalist theories of archaeology in Israel (anti-Biblical Archaeology). Despite the wonderful finds that physically correspond to descriptions of places and objects in the Torah, these archaeologists have been doing everything to push their personal pet theories on to the public and the archaeological community in general - despite the finds. They have a lot of influence particularly with the weight of their university behind their agenda. On the other side, there have been leading individual archaeologists (such as the Mazar family) that have been doing excellent field work that debunks these anti-Israel archaeologists. But it hasn’t been enough - there's always the politics that gets in the way of the truth. Bar-Ilan University has decided to enter the fray. Bar Ilan will be opening an archaeological department to “serve as a counterweight to revisionist historians who dismiss any connection between archeology and the Bible” whom they better describe as "post-modernist revisionist nihilists" . About time, and I would love to take a course if I can. Well here is some unexpected potentially good news. Even though I don’t approve of excessive (any) government intervention in our daily lives I actually find myself trying to limit my time on the road because Israeli drivers these past few months have become very scary. "Hundreds of marked and unmarked police cars will patrol the nation's highways over the next two weeks in a widespread operation to enforce driving laws, particularly on Israel's major traffic arteries. Helicopters will monitor traffic from the air, Army Radio reported." "There are violations we consider 'road bullying', and we don't let people guilty of them off," Ayalon continued. Like everyone, I don’t like the idea of having to constantly look over my shoulder, that there might be a policeman around (even if I’m not guilty), but then again, nor do I like the Israeli, a mile down the road speeding at me at 150 with flashing brights trying to bully me out of his way on "his" road. So if Israelis have proven to lack even the most minimal self-discipline and courtesy on the roads, then maybe this is a good thing. Jameel and I have been sharing books lately, so I might as well officially announce the formation of the Joe-Jameel Book Club. Why do I bring this up? Mostly because of ‘Off the Derech’ opened my eyes to how cynical I and others have become to various rabbinical halachic ‘decrees’ as of late, and how it can affect one's religiousity. I mean seriously, how can you take the concept of Avoda Zorah wigs seriously when the pronouncements come from the same circles that have actually forbidden pizza shops in Bnei Brak? More so, A lot of women in the Chareidi world (not those that burned their wigs right away) found it curious that that this happened right when some of the same rabbis are trying to get rid of ‘Custom’ wigs which they keep rallying against, or worse, simply trying to make money by requiring a ‘kashrut certificate’ (which as they predicted, every Jewish wig store now prominently displays). Or invisible bugs in the drinking water! After no one noticed bugs in the water for, well, forever, suddenly when NY Jewish society is driving itself even more rightward in an attempt to be externally yet even more makpid as it compensates for something internally lacking, this becomes an issue. How is it that things that were 100% OK for years (such as no mechitza on buses) are suddenly no good any more? Coincidence? Do you see why I may have become a little cynical? As it happens I picked up the Spring 2005 issue of the Journal of Halacha and Contemporary Society Books which discussed Copepods and Wigs (in separate articles). I can honestly say that while the articles were inconclusive regarding the final psakei halacha, at least I now understand the issues, the origins, and the positions - pro and con. I understand why some people take the problems seriously and why some don’t (but after all the talk of eyeballs and antennae running from the tap – forget halacha, the heebie-jeebies alone have converted me to bottled water). My point is that Jewish society is not what it was 100 years ago. Many people no longer accept blanket halachic pronouncements. There’s so much abuse of Halacha and obvious attempts to use it to modify society into someone else’s ideal that we tend to view all pronouncements with the same skepticism and cynicism. Out of necessity we’ve become the (Sym’s) Jewish Consumer. You want to sell us something, then educate us. Explain it fully. If not, we may ignore you (except those that need to be more rightwing for (or than) their neighbors). And that has become the big problem. We read in the newspapers half truths and incomplete accounts about what a certain rabbi said or paskened and you can guess what our immediate reaction becomes. More cynicism. Just look at how many yeshiva students will defend ‘daas torah’ to the end while chain smoking their cigarettes. Look how many people are attacking the Chief Rabbi with no knowledge of what he really said or wants to do. I happened to pick up the JHCS books and got a better insight into the problems of copepods and wigs. Knowing all the facts I can now make up my mind if this makes sense, if I should follow it (well I don't wear a wig, but you know what I mean), or if there is some ulterior motive or other nonsense behind the rulings. I am making myself into a better educated Jewish consumer (well I always have been, I think, but Shavuos gave me some time to catch up). But how many other Jews out there are not getting the information they need to make informed decisions? How many are becoming more cynical and ignoring things they shouldn’t be? How many may have even left Judaism because of this? If the rabbis want us to start having a better appreciation and more respect for what they have to say, they are going to have to start working on their hasbara. Partial information from third party sources is not enough, and in the internet age where getting information out is not a problem, they had better get with it – and that includes those that say that the internet is treif. Wow! A few hundred Leftists came to a rally demanding an ‘End to the Occupation’. I’m impressed they managed to get that many, there must have been free music.